Draft: 2010, Philadelphia Phillies, 1st rd. Selected by the Philadelphia Phillies in the first round (27th overall) of the 2010 First-Year Player Draft...Signed by Eric Valent...Acquired by the Pittsburgh Pirates from the Philadelphia Phillies in exchange for RHP Yoervis Medina on February 3, 2016...Claimed off waivers by the Atlanta Braves from the Pittsburgh Pirates on March 19, 2016. ..On Atlanta disabled list (recovering from left elbow surgery) from April 3 through the end of the 2016 season. 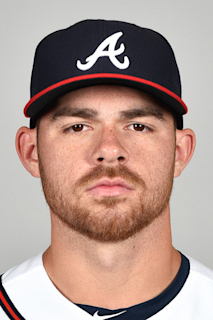 Spent the majority of the season in Atlanta after he made his MLB debut on 4/21 vs. NYM…Appeared in 60 games out of the bullpen for Braves, going 6-1 with a save and a 3.11 ERA (22 ER/63.2 IP) ... Pitched more than 1.0 inning in 14 outings, compiling a 0.95 ERA (3 ER/28.1 IP) with 43 strikeouts...Three of his six wins this season came in outings longer than 1.0 inning ... Fanned eight batters in 3.0 innings of relief, 6/2 vs. WSH, to become the first Braves reliever in 110 seasons to strike out at least eight batters in that few innings ... Milwaukee's Josh Hader struck out eight batters to earn a 2.2-inning save on 4/30/18 at CIN…Prior to that, the last reliever to strike out eight or more batters in 3.0 innings or less of work was the Yankee's Ron Davis on 5/4/81…Davis got nine outs, eight by strikeout ... Since the franchise moved to Atlanta in 1966, only one other reliever struck out eight batters in a game...Rick Kester fanned eight Houston Astros over 5.2 innings on 9/13/70 at the Astrodome ... Threw 50 pitches, 33 for strikes during his outing...Michael A. Taylor flew out to right field to lead off the 12th inning for the lone non-strikeout out ... Compiled a 2.32 ERA (14 ER/54.1 IP) over 48 games through the end of the August…Allowed 10 runs, eight earned, over 9.1 innings in 12 September games ... Limited right-handed hitters to a .194 average (26-for-134) and a .586 OPS…Lefties hit .253 (24-for-95) and compiled a .751 OPS ... Struck out 67, two behind teammate A.J. Minter for the most by a rookie left-handed reliever in the National League…Since the franchise moved to Atlanta in 1966, the only rookie left-handed relievers to strike out more than Biddle were Jonny Venters (93 in 2010) and Minter ... Held opponents to a .102 average (12-for-118) when he got two strikes…That was the fifth-best mark among qualified pitchers in the N.L. ... Earned his first career win in his major league debut, tossing a scoreless ninth inning in the Braves' 4-3 win vs. NYM on 4/21 ... Collected his only save, 8/5 at NYM, tossing a scoreless 10th inning ... Doubled for his first career hit, 4/29 at PHI ... Began the season with Triple-A Gwinnett, making four scoreless appearances before the Braves recalled him on 4/17. Spent the season with Double-A Mississippi, appearing in a career high-tying 27 games in relief…Marked his first season working as a full-time reliever…Made one relief appearance (in 2011) prior...Finished the season on the disabled list with a left shoulder strain…His final appearance came on 7/11 vs. Jacksonville...Righties went 26-for-134 (.194) with a .306 slugging percentage against him, while lefties hit .400 (22-for-55) and slugged .509...Went more than 1.0 inning in 20 of his 27 outings, including a season-high 3.2 innings on 5/10 vs. Mobile. Missed the entire season recovering from 2015 "Tommy John" surgery ... Traded from Philadelphia to Pittsburgh on 2/3/16 before the Pirates designated him for assignment on 3/15...Joined the Braves four days later on 3/19. Went 9-6 with a 4.95 ERA (69 ER/125.1 IP) in 24 combined starts between Double-A Reading and Triple-A Lehigh Valley ... Promoted to Lehigh Valley on 7/8 and won each of his first two decisions with the IronPigs ... Named both the International League and the Phillies Minor League Pitcher of the week for the week of 7/13-19 after going 1-0 with a 0.00 ERA ... Placed on the disabled list on 8/28 with a left elbow sprain and missed the remainder of the season...Underwent "Tommy John" surgery performed by Dr. Michael Cicotti on 10/15. Began season with Double-A Reading...Placed on the DL on 8/22 with a strained right quadriceps and missed remainder of the season. Spent the entire season with Double-A Reading... Finished tied for first in the Eastern League in starts, tied for second in complete games, third in strikeouts and ninth in ERA ... Selected to the EL mid-season All-Star team ... Took a perfect game into the seventh inning on 4/22 at Harrisburg while recording a career-high 16 strikeouts; also went 2-for-3 with a pair of doubles at the plate ... Earned the win for the U.S. team at the All-Star Futures Game on 7/14 at Citi Field...Went 1.1 innings, striking out one and walking one. Spent entire season with High-A Clearwater ... Finished first in the Florida State League in strikeouts, tied for second in wins and starts, third in ERA and fourth in innings pitched ... Named to the FSL's mid-season All-Star team... Also took home Florida State League Pitcher of the Week honors on two occasions (5/28 to 6/3 and 8/20-26) ... Threw 7.0 no-hit innings on 8/17 vs. Brevard County ... Named Philadelphia's top prospect by Baseball America following the season. Spent the season with Single-A Lakewood and was named by Baseball America as Philadelphia's second-best prospect following the season. Made his professional debut with the GCL Phillies ... Tabbed by Baseball America as Philadelphia's eighth-best prospect following the season. April 18, 2018 Atlanta Braves recalled LHP Jesse Biddle from Gwinnett Stripers. March 9, 2018 Atlanta Braves optioned LHP Jesse Biddle to Gwinnett Stripers. October 2, 2017 Atlanta Braves recalled Jesse Biddle from Mississippi Braves. July 12, 2017 Mississippi Braves placed LHP Jesse Biddle on the 7-day disabled list. March 8, 2017 Atlanta Braves optioned LHP Jesse Biddle to Mississippi Braves. November 4, 2016 Jesse Biddle roster status changed by Atlanta Braves. March 19, 2016 Atlanta Braves claimed LHP Jesse Biddle off waivers from Pittsburgh Pirates. March 16, 2016 Pittsburgh Pirates released LHP Jesse Biddle. March 15, 2016 Pittsburgh Pirates designated LHP Jesse Biddle for assignment. February 3, 2016 Philadelphia Phillies traded LHP Jesse Biddle to Pittsburgh Pirates for RHP Yoervis Medina. January 29, 2016 Philadelphia Phillies designated LHP Jesse Biddle for assignment. October 5, 2015 Philadelphia Phillies recalled LHP Jesse Biddle from Lehigh Valley IronPigs. September 14, 2015 Lehigh Valley IronPigs activated LHP Jesse Biddle from the 7-day disabled list. July 8, 2015 LHP Jesse Biddle assigned to Lehigh Valley IronPigs from Reading Fightin Phils. March 16, 2015 Philadelphia Phillies optioned LHP Jesse Biddle to Reading Fightin Phils. November 20, 2014 Philadelphia Phillies selected the contract of Jesse Biddle from Reading Fightin Phils. October 29, 2014 LHP Jesse Biddle assigned to Indios de Mayaguez. September 18, 2014 Reading Fightin Phils activated LHP Jesse Biddle from the 7-day disabled list. August 14, 2014 LHP Jesse Biddle assigned to Reading Fightin Phils from Clearwater Threshers. August 6, 2014 LHP Jesse Biddle assigned to Clearwater Threshers from Reading Fightin Phils. July 26, 2014 sent LHP Jesse Biddle on a rehab assignment to GCL Phillies. June 26, 2014 Reading Fightin Phils placed LHP Jesse Biddle on the temporarily inactive list. January 8, 2014 Philadelphia Phillies invited non-roster LHP Jesse Biddle to spring training. March 30, 2013 LHP Jesse Biddle assigned to Reading Fightin Phils from Clearwater Threshers. April 4, 2012 Jesse Biddle assigned to Clearwater Threshers from Lakewood BlueClaws. April 2, 2011 Jesse Biddle assigned to Lakewood BlueClaws from Williamsport Crosscutters. August 18, 2010 Jesse Biddle assigned to Williamsport Crosscutters from GCL Phillies. June 21, 2010 Jesse Biddle assigned to GCL Phillies from Philadelphia Phillies. June 10, 2010 Philadelphia Phillies signed LHP Jesse Biddle.